Virginia Social Worker Storm Durham Fired for Having Concealed Carry Permit-Unproven! - Truth or Fiction? Virginia Social Worker Storm Durham Fired for Having Concealed Carry Permit-Unproven! 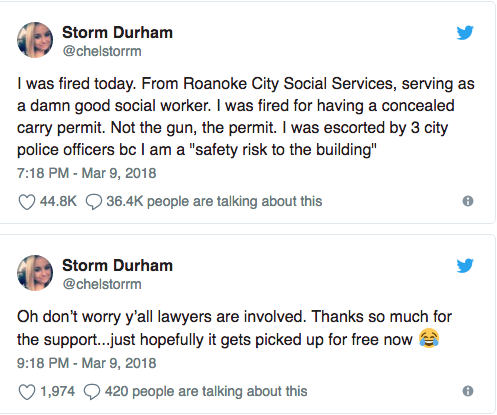 A social worker from Roanoke, Virginia, named Storm Durham was fired for having a concealed carry permit. Storm Durham claimed in a viral social media post that she’d been fired from her job as a social worker for having a concealed carry permit. But Durham later admitted that she failed to close a predetermined number of cases in her employee evaluation and was also “cited” for wearing loafers on the job. And the City of Roanoke has released a statement denying Durham’s claims. There’s no way to confirm claims that social worker Storm Durham was fired for holding a concealed carry permit. The city of Roanoke denies the claim but has declined to comment further. The tweet went viral almost immediately. Opponents of gun control laws have long argued that government-maintained lists of gun owners could be used to punish them. Storm Durham’s account appeared to reinforce those fears, which led to her tweets going viral. But it’s not clear that Daniels was fired for having a concealed carry permit. A number of social media users followed up with personal accounts of Durham’s performance at work, pushing back against the idea that she was fired for having a concealed carry permit. Posts claimed that Durham’s boyfriend had threatened her coworkers and brought a gun into the office. Durham denied those claims in a Facebook Live video stream. But she acknowledged performance issues, noting that she hadn’t closed a predetermined number of cases and was cited for waring loafers to a training session. Roanoke, VA – A former employee of the City of Roanoke recently posted via social media assertions regarding the basis of her dismissal from City employment. Her posting has also been reported in other media. The City does not publicly comment on specific personnel matters. In light of these assertions, however, it is important to note that the City of Roanoke respects the Constitutional rights of its citizens and that the dismissal in question was not based upon anyone’s exercise of such rights.